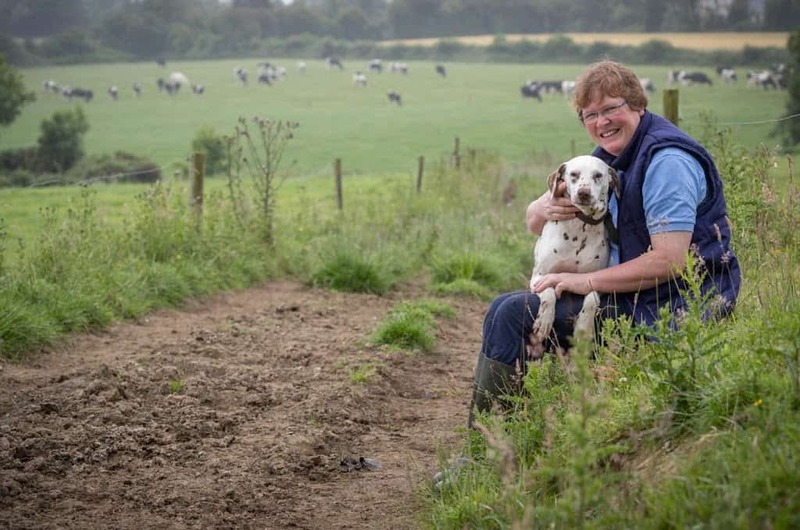 In this guest blog, Aisling Molloy, Drystock Adviser with Teagasc, the Agriculture and Food Development Authority in Ireland, one of the founding members of the South-East Women in Farming group and former Teagasc Walsh Fellow outlines the key role women play in agriculture, and provides us with some findings and recommendations derived from her MAgrSc research thesis entitled ‘How Teagasc Advisory Services Can Improve Engagement with an Empowerment of Farm Women’, that she carried out as part of her Masters Degree in Agricultural Innovation and Support Programme at Teagasc and University College Dublin (UCD). 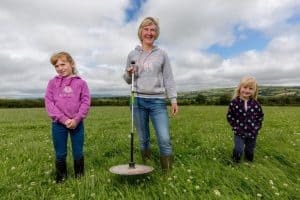 The link between women’s active role on farms and the potential for multi-functionality and innovative farm enterprises has been highlighted in numerous studies throughout the world (Gorman, 2006; Jarosz, 2011; Mulhall and Bogue, 2013). Furthermore, Rahman (2010) found that technical efficiency is significantly improved where females are working on a farm. Women’s role in agriculture, is often understated however and in many cases, invisible. 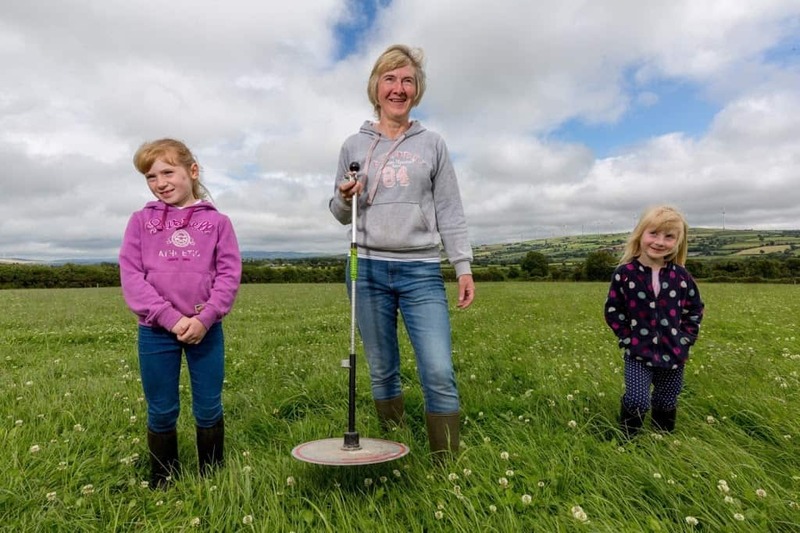 According to the CSO (2012), 74,092 women worked on Irish farms in 2010, making up 27% of the agricultural workforce. However, only 4,829 are registered clients with the public farm advisory service (Teagasc); meaning that there are over 69,000 farm women in Ireland not engaging with agricultural advisory services. Factors contributing to this low level of engagement include traditional gender roles and relationships in farming, as well as structural or cultural barriers in the way that advisory services are provided. Research findings from my Masters in Agricultural Innovation and Support research thesis, carried out with 233 women working and/or living on farms in Co. Wexford, indicate that agricultural advisory services need to make a more conscious and concerted effort to include farm women. Empirical research findings illustrate that the majority of research respondents engage with advisory services less than 3 times per year, despite having a keen interest in learning about cash-flow planning, business planning, soil fertility, animal nutrition, personal development and computer skills, all of which would ultimately aid in the development of their farms. Farm women’s learning needs must be considered when designing future agricultural advisory programmes. Based on the study results, I propose that the lack of engagement currently being experienced could be eradicated by naming family members in correspondence (i.e. letters/invites to events/newsletters etc.) and by publishing gender-balanced material. Furthermore, training should be provided to agricultural advisers to make them aware of farm women’s needs. Moreover, the surge in interest and activity from the various regional groups of farm women in operation throughout Ireland, such as South East Women in Farming, West Women in Farming, North West Women in Farming and Meitheal na mBan – Rural Women Munster, offers an increasing opportunity for Teagasc and other agricultural organisations to collaborate further with female farmers in attendance at the various meetings they organize and to gain a greater insight into the type of information and specific needs that farm women require. Female discussion groups could also be piloted by such organisations to evaluate whether or not they could be effective in increasing women’s engagement with agricultural advisory services. Highlighting female farmers more in the media is another key strategy that may increase engagement. Overall, I believe that a greater engagement with agricultural advisory services would enhance and empower women’s contribution to decision making processes on the farm around key areas of technology uptake for example, ultimately benefiting viability and competitiveness on their home farms, and the agri-food sector more generally. Indeed, on a global scale, the Food and Agriculture Organisation of the United Nations (2011) have estimated that if farm women had similar access to resources as their male counterparts, agricultural output could be increased by as much as 4% and global hunger reduced by 12-17%. Aisling Molloy hails from a suckler beef and tillage farm in Co. Offaly. She completed an Animal Science degree in University College Dublin (UCD) in May 2015, where she carried out work experience on dairy, beef, sheep and pig farms. She then travelled to South Dakota in the U.S.A for 2 months to work on a dairy farm that was expanding from 3,000 to 4,000 cows. In September 2015, Aisling began the Teagasc and UCD Masters in Agricultural Innovation and Support Programme. As part of this programme, she spent 4 months in UCD studying various modules and in January 2016 commenced a 15-month work experience placement in the Teagasc advisory office in Enniscorthy, Co. Wexford. Aisling completed her thesis entitled ‘How Teagasc Advisory Services Can Improve Engagement with an Empowerment of Farm Women’ as part of the programme in conjunction with her supervisors Dr. Monica Gorman (UCD) and Ms. Jane Kavanagh (Teagasc). Since January 2017, Aisling has been working as a Drystock Adviser with Teagasc. 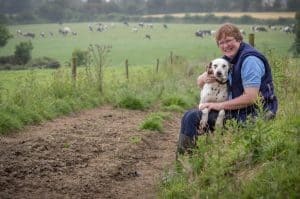 Aisling is also one of the founding members of the hugely successful South-East Women in Farming group. 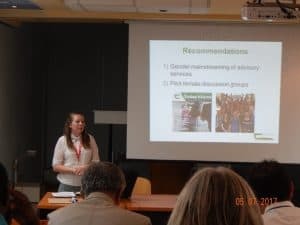 Above: Aisling Molloy presenting her research at the 23rd European Seminar on Extension and Education (ESEE) that took place in the Mediterranean Agronomic Institute of Chania, Crete, Greece in July 2017. Above: Niamh, Hannah and Ciara Doyle. Sheep, beef and tillage farmers in Ballinacoola, Co. Wexford. Source: Teagasc. Above: Aileen Kavanagh. Dairy farmer in Bunclody, Co. Wexford. Source: Teagasc. Gorman, M. (2006). Gender relations and livelihood strategies. In Bock, B.B. and Shortall, S. (2006) Eds. Rural Gender Relations: Issues and case- studies. Pg. 27-46. CABI, Oxfordshire. Rahman, S. (2010). Women’s Labour Contribution to Productivity and Efficiency in Agriculture: Empirical Evidence from Bangladesh. Journal of Agricultural Economics. 61(2): 318-342. Jarosz, L. (2011). Nourishing Women: Toward a Feminist Political Ecology of Community Supported Agriculture in the United States. Gender, Place, and Culture. 18: 307–26. Mulhall, L. and Bogue, P. (2013). NRN Case Study: Women in Agriculture.